Copyright © 2019 All Rights Reserved. Musictoday II, LLC, is the seller of all Nettwerk Music Group merchandise and is solely responsible for all aspects of your purchase. 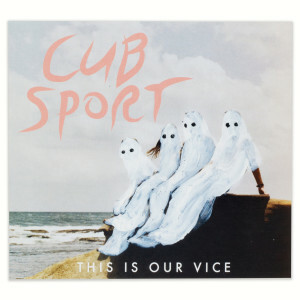 There are a handful of seminal bands from Brisbane, Australia, but few have achieved the breakout success that the dreamy indie-pop group Cub Sport has in merely three years. The blissed-out, anthemic title track from their first EP, Told You So, attracted global attention, which in the U.S. alone vaulted it up the top 20 college-radio chart. And based on enthusiasm for that debut, their second EP, Paradise, won Stateside audiences, too, thanks to airplay at influential radio outlets such as KEXP, WXPN and KCRW. After touring everywhere from Singapore to Philly, Cub Sport — which features lead vocalist Tim Nelson, guitarist Zoe Davis, drummer Dan Puusaari and keyboardist Sam Netterfield—will release their hotly anticipated debut full length, This Is Our Vice, March 4, 2016.